The importance of an overhead stirrer in the laboratory cannot be underestimated. They play a critical role in many research projects. Your stirring requirements demand flexibility and impeccable performance which is exactly what the Oxford Lab Products BenchMate Overhead Stirrer provides. The brushless DC motor of the Oxford Lab Products BenchMate Overhead Stirrer provides quiet operation and maintenance-free long product lifespan and operational excellence. The unit is microprocessor controlled for maintenance of accuracy even with viscous liquids. The Oxford Lab Products BenchMate Overhead Stirrer is capable of processing liquids with a viscosity of up to 30,000 mPas and a volume of up to 40 Liters. It has an adjustable speed ranging from 50 rpm up to 2,000 rpm and a long timer setting from 1 min to 99 hours 59 mins, and continuous mode. 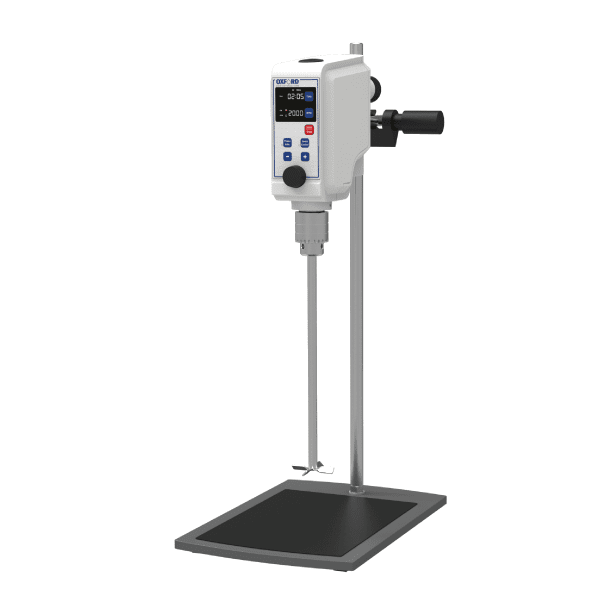 The Oxford Lab Products BenchMate Overhead Stirrer allows reversible mixing direction or motion from clockwise to counterclockwise for increased mixing efficiency. The large digital display is ideal for viewing all the parameters at one glance and the Smart control provides uninterrupted operation. The unit is equipped with safety power cut-offs for overload, over-current and overheat, and counteracts any speed changes via the push-through shaft for viscous liquids or smaller vessels. Looking for a regular magnetic stirrer? Check out our BenchMate MS1 and MS4 Magnetic Stirrer. Brushless DC motor for quiet operation and maintenance-free long product lifespan and operational excellence. Microprocessor controlled for maintenance of accuracy even with a viscous liquid. Capable of processing liquids with a viscosity of up to 30,000 mPas and a volume of up to 40 L.
Adjustable speed ranging from 50 rpm up to 2,000 rpm. Long timer setting from 1 min to 99 hours 59 mins, and continuous mode. Reversible mixing motion – Clockwise and Counterclockwise. Large digital display for viewing of all the parameters at one glance. Uninterrupted operation through Smart control. Safety power cut-off for overload, over-current and overheat. Counterreaction to speed changes – Push through shaft for viscous liquids or smaller vessels.